Depending on the precise wording of the Conditions of Contract the term or phrase Access to Site can have a number of meanings or interpretations. Normally Access to Site refers to the means and availability of the Contractors approach to the Site as defined in the Contract. It may also mean the ability to occupy the Site which is commonly referred to as Site Possession or Possession of the Site. Firstly we will consider Access to the Site on which the Works are to be constructed. Access to the Site is necessary to allow the transportation and delivery of construction materials, plant, labour and equipment as well as to allow the installation and connection of utility services necessary for construction and indeed operation of the completed Works. In order to be effective the access must facilitate the Contractor in being able to transport, install, connect and delivery all the above the above and must be available for the Contractor at the appropriate times. This does not just mean that the access is physically available; it must also be legally available taking into account and requirements to obtain approvals, permissions and meet with any other customs or requirements. The Contract Conditions together with any other documents making up the Contract Documents should clearly define the parties’ responsibilities and obligation in respect of the provision of Access to Site. In nearly all standard forms expressly state that it is an obligation of the parties to co-operate in order for the Contractor to be able to execute the Works and unless specifically stated otherwise it is in implied terms that the parties should co-operate in this goal of executing the Works. The extent of this obligation to provide access and obtain permissions will depend upon others; the type of work involved; the extent of possession; the control of adjacent areas exercised by that party; together with any other relevant circumstances. Even where the term is implied that physical access is to be provided by one party, the term may not extend to requiring that party to be held responsible for the suitability of the Access to the Site. The standard forms generally in use in Malaysia expressly state the responsibilities for Access to Site, in terms which reflect the type of work envisaged and the expected normal use to which the forms were published. The Red book (4th Edition) places the responsibility for ensuring that Access to Site is available for the execution of the Works with the Employer. However the obligations for payment of fees and the like together with costs of any improvements and maintenance lie with the Contractor. Sub-Clause 42.1(d) of the Conditions of Contract requires that the Employer shall provide such access as is necessary for the Contractor to properly execute the Works in accordance with his programme as submitted in accordance with Clause 14 or otherwise proposed by the Contractor. However the Contractor shall be responsible for the payment of any fees, charges or costs in the securing of such Access to the Site in accordance with Sub-Clause 42.3 of the Conditions of Contract. Sub-Clause 26.1 of the Conditions of Contract place the obligation of ensuring that all permissions required for the works to proceed including those of surrounding property owners with the Employer and places the payment in connection with such on the Contractor. Clause 30 of the Conditions of Contract place the obligation for maintaining access and improvement works of the Access to Site with the Contractor. The FIDIC Red, Orange and Yellow Forms 1999 place the main responsibility for access on the Contractor whilst requiring the Employer to assist the Contractor where the Contractor so requests. Sub-Clause 2.2 of the Conditions of Contract only requires the Employer to provide reasonable assistance, and then only at the Contractor’s request, for the Contractor’s application for permits, licences or approvals including clearance through customs and export of the Contractor’s Equipment when removed from Site. Sub-Clause 4.13 of the Conditions of Contract makes the Contractor responsible for special and/or temporary rights of way including those for Access to the Site. Under Clause 4.15 it is for the Contractor to satisfy himself as to the suitability and availability of access to the Site, and is responsible for obtaining permissions to use the route and signs. Clause 4.15 expressly provides that the Employer does not guarantee the suitability or availability of particular access routes. The IEM Conditions of Contract places the responsibility of Access to the Site. Clause 14 of the Conditions of Contract requires the Contractor to take account and satisfy himself in respect of Access to the Site and such is deemed included within his tender amount. Sub-Clause 38 (b) (ii) places the obligation in respect of payment of all expenses fee, charges and costs for any special or temporary way-leaves require in providing Access to the Site. The PAM Contract 2006 places responsibility for the provision of access to the site on the Employer however as mentioned above it is implied that although physical access is to be provided by Employer, the term may not extend to requiring that party to be held responsible for the suitability of the Access to the Site. Sub-Clause 23.8 states that failure of the Employer to give in due time entry to or exit from the site or any part through or over any land, by way of passage adjoin or connected to the site and in possession and control of the Employer is a relevant event justifying adjustment of the contract period. Thus it clearly implies the Employer is the party responsible for the provision of site access. The term possession or use or occupation is contained within many standard forms of contract to describe the Contractors right to enter the Site, occupy and use the Site and carry out the specified Works. During the Contract Period, possession will usually provide the Contractor with such exclusive occupation and use the Site as required to construct the Works. At the end of the Contract Period, the Contractor may require partial occupation of the Site to carry out performance tests. In this case the Contractor use will usually override the Employers operation or use of the facility to conduct such tests. During the defects correction period, the Contractor will usually only require sufficient access to those parts of the facility which allow him to correct the defects or outstanding minor works. His access and use will usually be secondary to the Employers operation or use of the facility. The meaning and extent of possession of the Site, and the apportionment of risk for events that interfere with possession, will depend upon the express and implied terms of the Contract. The extent of uninterrupted possession will depend generally upon the nature of the work. In sub-contracts particularly in building works, often all work is carried out alongside other sub-contractors with the resulting interference. In some cases there will not be continuous working and the Contractors failure to obtain areas and access needed by the sub-contractors will not be a breach of sub-contract, provided the Contractor made sufficient effort to obtain them. If the Contractor is entitled to possession of the whole site until completion then in the absence of express terms, the Employer will not be entitled to take possession of part of the site before completion of the Works. A construction contract requires that the Employer to give the Contractor such possession, occupation or use of the Site as is necessary to enable him to perform the Works under the Contract. In a new project in the absence of an express term in the Contract it would normally be implied into a construction contract that the site would be handed over within a reasonable time and, in most cases, with a sufficient uninterrupted possession to allow the Contractor to carry out his obligations using the method of his own choice. Generally standard forms of contract commonly used in Malaysia expressly give a right of access to the Site for the Employer, his professional team and necessary contractors employed by the Employer. In the absence of an express term, a term will usually be implied that the Employer and the professional team will have a right of access for quality inspection, monitoring, measurement and supervision and administration of the Contract. In most cases the nature of the Contractors possession of the Site is that of a contractual licence to enter, occupy and use the site. It would appear to be common sense that where the Employer no longer wishes the Contractor to complete the Works, that he should be able to suspend the works and expel the Contractor from the site. The Contractors usually has no interest in the site itself or in the construction of the Works, but in the profit generated by the completion of Works. In that case insofar as the Employers actions are a breach of contract, the Contractor can be adequately compensated by damages through the Contract provisions. Many standard forms of Contract recognise this type of situation, and provide appropriate procedures for “termination at will” with suitable remedies. As stated above the Contractors possession of the Site as provided for by standard form contracts is a temporary licence to occupy the site, and then only as necessary to carry out his obligations under the Contract. A distinction has to be made between possession of the site and possession of the Works. In English Industrial Estates Corporation v George Wimpey & Co Ltd  Wimpey was the Contractor for an extension to a factory owned by the Corporation. By January 1970 a great deal of the work had been done and part of the factory was being used by Reeds who leased it from the Corporation. On 18th January 1970 there was a disastrous fire. Wimpey argued that the use and occupation by Reeds amounted to taking possession of those parts. A distinction was made between taking possession of a building and taking possession of building works. The installation of equipment, or the occupation and use of a part or section of the works was not to be confused with consensual transfer of possession. Taking possession of part of the works with consent was more than the sort of use and occupation and installation of equipment which occurred. The Contractors possession of the site for the construction of the works does not therefore necessarily give the contractor possession for other legal purposes. The Contractors occupation of the site and his execution of the works will however create potentiality liability to third parties for his actions. He may be liable for any damage either by physical injury to neighbouring premises or property on the premises, or by interfering with the comfort and convenience of the neighbouring occupiers. He may find himself liable for infringing various rights of water, air, light, support, rights of way and wayleaves. The extent to which the Contractor is indemnified by the Employer will depend upon the express terms of the contract. Normally the Contractor will be held liable for the consequences on third parties of his methods of working, unless these are specified in the Contract. In respect of the completed works themselves, the general legal principle will apply, that the Employer will indemnify the Contractor for the necessary consequences of the act carried out at his request in this case of constructing the works. The Contractor is generally entitled to possession of more than the actual site on which the structure stands in order to carry out the works. This will usually include reasonable working space. It is necessary to examine the contract documents to ascertain whether any parts of the site normally available will not be made available. The extent to which the possession is free of interference depends upon the type of work and all the circumstances and particularly the express terms of the Contract. Where the Contractor takes responsibility for the safety of the works throughout the site and for the method of constructing the works, then it is likely that the Contractor will be considered to have exclusive possession of the Site in order to give him the required control of the Site. This will be subject to express terms, and the implied right of access to the Employer for monitoring, supervision and administration of the Contract. The standard forms generally in use in Malaysia expressly state the responsibilities for Site Possession, in terms which reflect the type of work envisaged and the expected normal use to which the forms were published. Sub-Clause 42.1 provides that the Employer shall grant possession of the site or parts of the site to facilitate the Contractor in execution of the Works in accordance with his programme. The FIDIC Red, Orange and Yellow forms of contract place the obligation for providing possession of the Site on the Employer. The extent to which the site is to be provided is defined very widely. The Contractors obligations include the safety of the Site and require him to have extensive control of the Site. The extent of possession is not exclusive to the Contractor, but the right of access to other contractors is prescribed, otherwise interference will be a variation to the Contract with consequent entitlements. There is an express right of access for the Engineer to carry out their functions under the Contract. After completion, the Contractor has rights of access to remedy defects during the Defects Notification Period, and access to the Works, although circumscribed, to repeat failed Tests after Completion. The Employer may terminate the Contract at any time for his convenience. Clause 2.1 gives the contractor possession of all parts of the Site at the times stated in the Appendix to Tender (Particular Conditions in the Silver Form). If the contract specifies that the Employer is to give possession of any foundation, structure or plant, then he must do so in the time and manner stated in the Specification. If the Contract is silent then the possession is required to be at such time as to allow the Contractor to proceed in accordance with the submitted programme. The Employers failure to give possession at the appropriate time entitles the Contractor to an extension of time and payment of Cost and profit if not caused by the Contractor, subject to notice. Clause 17.3 (f) Red and Orange Forms provides that the Employers Risks, which entitle the Contractor to extension of time for consequent delay and payment of Cost incurred, includes use or occupation by the Employer of any part of the Permanent Works except as may be specified in the Contract. Clause 1.1.6.7 defines “Site” to mean the place where the Permanent Works are to be executed and to which Plant and Materials are to be delivered, and any other places as may be specified in the Contract as part of the Site. Clause 2.2 only requires the Employer to provide reasonable assistance at the Contractors request, for the Contractors applications for permits, licences approvals where the Employer is in a position to do so. Clause 1.13 requires the Employer to obtain planning, zoning or similar permissions for the Permanent Works, unless the Particular Conditions state otherwise. The Contractor is required to obtain all the permits, licences and approvals for carrying out the Works. Clause 4.1 makes the Contractor responsible for the adequacy, stability and safety of all Site operations and all methods of construction. 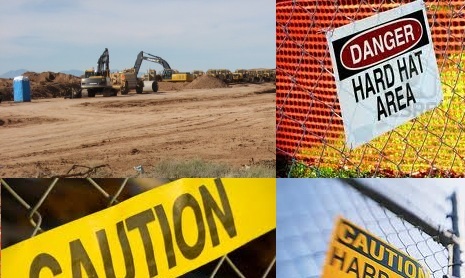 The extent of responsibility will of necessity require the Contractor to have extensive control of the Site, and would therefore suggest that use of the Site by others will need the approval and permission of the Contractor, at least to the extent that it affects the adequacy, stability and safety of the Site operations and methods of construction. Clause 2.1 expressly states that possession may not be exclusive to the Contractor. Clause 4.6 requires the Contractor to allow opportunities for carrying out work to the Employers Personnel, any other contractors employed by the Employer and any legally constituted public authorities, but only where specified in the Contract or instructed by the Engineer and in the execution on or near the Site of any work not included in the contract. Any such instruction is stated to constitute a Variation if and to the extent that it causes the Contractor to incur Unforeseeable Cost. Clause 4.22 requires the Contractor to keep unauthorised persons off the Site, unless otherwise stated in the Particular Conditions. Authorised persons include the Employers Personnel which is defined at Clause 1.1.2.6 to include the Engineer and all staff, labour and other employees of the Engineer and the Employer. Authorised persons also include other personnel notified to the Contractor by the Employer and the Engineer. Clause 7.3 provides that the Employers Personnel have full access to all parts of the Site at all reasonable times, and the Contractor is to give the Employers Personnel full opportunity to carry out examination, inspection, measurement and testing including access, facilities, permissions and safety equipment. Clause 11.7 provides that until the Performance Certificate has been issued, then during the Defects Notification Period the Contractor has a right of access to the Works as is reasonably required in order to remedy defects and complete outstanding work, except as may be inconsistent with the Employers reasonable security restrictions. Clause 12.4 of the Yellow and Silver Forms only, provide that if the Works fail to pass a Test after Completion (if specified) then the Employer may instruct that adjustments or modifications cannot be made until a time that is convenient to the Employer. If the Contractor incurs additional Cost as a result of any unreasonable delay by the Employer in permitting access to the Works, then subject to notice he is entitled to payment of the Cost plus profit. Clause 38 Sub-Clause (b)(1) provides that the Employer shall make available the site to the Contractor to execute the works in accordance with the programme. Failure of the Employer to do so will result in the Engineer granting the Contractor an extension of time for the completion of the Works. Clause 42 deals with partial possession by Employer in a very similar fashion to PAM and FIDIC. Sub-Clause 43 (g) as with PAM states that the Contractor is entitled to an extension of time where the Employer is late granting possession of site to the Contractor. Sub-Clause (ba) of Article 7 of the Agreement states that the Site means the land and other places on, in, under, other or through which the Works are to be executed and is provided by the Employer for the purpose of the Contract including other land and places obtained by the Contractor and accepted by the Employer as forming part of the Site. Sub-Clause 16.3 states that the Contractor shall on the written instruction of the Architect remove his plant and equipment from the parts of the site occupied by the Employer. Sub-Clause 23.8 (f) states that by the Employer giving late possession of site or any section of the site it entitles the Contractor to an extension to the time for completion.